Manchester City have extended their Premier League lead over Manchester United to 15 points. Raheem Sterling gave Manchester City the lead on the 31st minute with his 17th goal of the season in all competitions. Vincent Kompany’s injury woes continue with the City skipper limping off after just eleven minutes. 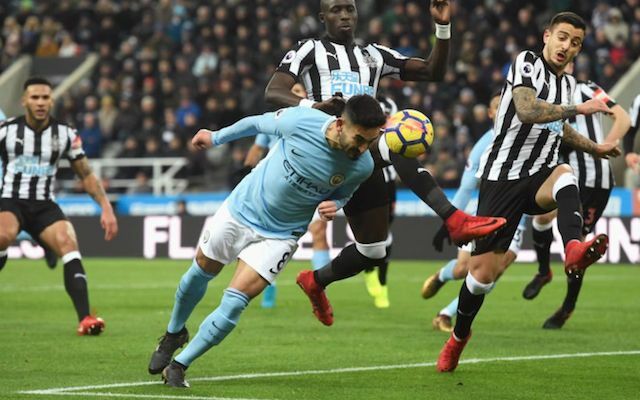 Manchester City extended the lead at the top of the Premier League to 15 points after a Raheem Sterling goal fired them to victory against Newcastle United. Raheem Sterling put City 1-0 ahead at St James’ Park after latching onto a superb assist from Kevin De Bruyne. The Belgian midfielder clipped a lovely ball over the top of the Newcastle defense for Sterling to poke home on the 31st minute. Not everything went to plan however for City in the first-half with Vincent Kompany limping off after just eleven minutes to be replaced by Gabriel Jesus as Fernandinho dropped back to cover at centre-back. City extended their incredible winning record in the Premier League to 18 matches and it appears that Pep Guardiola’s side really cannot be stopped. Newcastle however now sit just one point above the relegation zone. Raheem Sterling has been transformed from an inconsistent talent to a goalscoring regular under Pep Guardiola. This season has seen Sterling considerably bolster his goalscoring talents and his 17th goal of the season in all competitions was the difference in tonight’s tie. Vincent Kompany has been plagued by injuries in recent seasons and tonight was no different. The Manchester City captain had to leave the field of play after just 11 minutes. You would have to feel that Guardiola’s head is now likely to be turned by Kompany’s latest injury and with the January transfer window opening next week we certainly would not be surprised if Pep dipped into some extra funds to bring in some further defensive cover. Newcastle United: Elliot 6, Yedlin 5, Mbemba 6, Lascelles 5, Dummett 5, Manquillo 5, Aarons 6, Diame 5, Shelvey 6, Murphy 5, Joselu 4. Subs: Gayle 6, Merino 5, Atsu 6. Man City: Ederson 7, Walker 6, Danilo 6, Kompany (C) 4, Otamendi 6, Fernandinho7, Gündo?an 7, De Bruyne 8, Bernardo 6, Sterling 8, Agüero 6. Subs: Mangala 6, Sané 6, Jesus 7. Man City are unstoppable! What a great game and what a 1:0 win away at Newcastle as they make it a 18th win!! Man City are ridiculous, what a squad pep has built?